Never give up on searching for what you are passionate about. You work too hard and put in too many hours to not love what you do. Anything is possible if you put your mind to it, set a goal and hustle. The key is hustle. You cannot wait around and look for someone else to do it for you. It is up to you to work hard to make what seems impossible actually possible. Putting in the time and effort now should allow you to enjoy the fruits of your labor later. This time of year, I hear from so many people that are “reevaluating” their career. This is the post-holiday, start of the year “blah” time. In sales, the opposite should be happening. This should be your reboot time. You should be refreshed, energized and ready to rock out a new year. You should already have your hustle on; setting up appointments, meeting clients and strategizing your year based on the goals you already developed. It is up to you and only you to map your course. Your employer is merely the resource to support you. If your sales manager has to push you to get out to sell and follow up with clients, it is time to self-reflect that this is in fact the career for you. The drive needs to be all yours. Your success and happiness will result from your own effort and drive. Be passionate about what you do. Recognize that sales success is driven by setting your own goals and wanting to achieve them for you. I am already living my goal I set forth two years ago. (Refer to Blog Gol!). I just recently returned from Puerto Vallarta, Mexico after working there for an entire month, remotely. I booked clients from my condo rental. I wrote blogs on my terrace. I had weekly consultation calls. I networked and met new people. My only foreign country “issue” was when my next door neighbor’s rooster interrupted by new client introduction call. I was disciplined and focused, waking up at 6:30 am to work the early mornings, went for my daily walks and then explored “my” new town in the daytime and evenings. I tried a multitude of new restaurants and was inspired. I learned a lot that I can now share with others. It was everything I wanted and more. 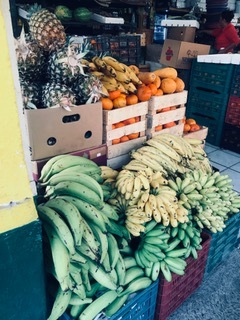 Each morning I would buy a banana from my local corner store for my breakfast. For 28 days. I also looked for a mango on that same shelf for 28 days. My storekeeper told me there were no mangoes for sale. On Day 29, I walked a new path. I wanted to explore the neighborhood that was more local and that my new friends told me about. I passed homes that were not nearly as decorated as the tourist rentals. Broken sidewalks. Loose dogs. Old cars. Then I found my destination. The Farmers Market. The first thing I saw were piles and piles of mangoes. I bought two. One for breakfast that day and one for my last breakfast before I headed to the airport to return to Chicago. I have no regrets. 28 days of bananas was still a dream come true, my dream. I now have a new goal for next year. I will explore new neighborhoods and look for plenty of mangoes.